Is California About to Clobber Local Control? The gradual decimation of local voice in planning has become accepted policy in Sacramento. The State Senate is now considering two dangerous bills, SB 35 and SB 167, that together severely curtail democratic control of housing. SB 35, the brainchild of San Francisco State Senator Scott Wiener, would force cities that haven’t met all their state-mandated Regional Housing Need Allocations to give by-right approval to infill market-rate housing projects with as little as 10% officially affordable housing. SB 35 is anti-free speech and civic engagement. No public hearings, no environmental review, no negotiation over community benefits. Just “ministerial,” i.e., over-the-counter- approval. Since almost no local jurisdiction in the State of California meets 100% of its market rate RHNA goal on a sustained basis, this bill essentially ensures by-right approval for market-rate projects simply by complying with a local inclusionary requirement [for affordable housing] or by building 10% affordable units. The practical result is that all market rate infill development in most every city in California will be eligible for by-right approval per this SB 35-proposed State law pre-emption. Berkeley Housing Commissioner Thomas Lord also has pointed out, the RHNA program itself is a pro-gentrification policy. It follows that passage of SB 35 would further inflate real estate values and worsen the displacement of economically vulnerable California residents. SB 35 is pro-traffic congestion. It would prohibit cities from requiring parking in a “streamlined development approved pursuant” to SB 35, located within a half-mile of public transit, in an architecturally and historically significant historic district, when on-street parking permits are required but not offered to the occupants of the project, and when there is a car share vehicle located within one block of the development. Other projects approved under the measure would be limited to one space per unit. Absent the provision of ample new public transit, the prohibition of parking in new development will worsen neighborhood traffic problems. SB 35 says nothing about new transit. The construction of on-site parking is expensive, up to $50,000 a space. A measure that exempts new development, as designated above, from including parking without requiring developers to transfer the savings to affordable housing is a giveaway to the real estate industry. Nor does SB 35 say anything about funding the amount of infrastructure and local services—fire and police, schools, parks—that would be required by the massive amount of development it mandates. Are local jurisdictions expected to foot the bill? The lineup of SB’s supporters and opponents reveals serious splits in the state’s environmental and affordable housing advocates. SB 35 has revealed serious splits among advocates for both environmental protection and affordable housing. Supporters include Bay Area Council, the lobby shop of the Bay Area’s biggest employers; BAC’s Silicon Valley counterpart, the Silicon Valley Leadership Group; the San Francisco and LA Chambers of Commerce; the Council of Infill Builders; several nonprofit housing organizations, including the Non-Profit Housing Association of Northern California and BRIDGE Housing; the Natural Resources Defense Council; the California League of Conservation Voters; and a panoply of YIMBY groups, including East Bay Forward and YIMBY Action. Opponents include the Sierra Club; the League of California Cities; the Council of Community Housing Organizations; the California Fire Chiefs Association; the Fire Districts Association of California; a handful of cities, including Hayward, Pasadena, and Santa Rosa; the Marin County Council of Mayors and Councilmembers; and many building trades organizations, including IBEW Locals 1245, 18, 465 and 551, and the Western States Council of Sheet Metal Workers. If a city does disapprove such a project, it is liable to a minimum fine of $1,000 per unit of the housing development project, plus punitive damages, if a court finds that the local jurisdiction acted in bad faith. a trade or industry group whose local members are primarily engaged in the construction or management of housing units or a nonprofit organization whose mission includes providing or advocating for increased access to housing for low-income households and have filed written or oral comments with the local agency prior to action on the housing development project [emphasis added]. The highlighted passage was added to the existing Housing Accountability Act to encompass BARF’s legal arm, the California Renters Legal Advocacy and Education Fund (CaRLA), whose lawsuit of Lafayette recently failed. Last week CaRLA re-instituted its lawsuit of Berkeley over the city’s rejection of a project at 1310 Haskell. Predictably, the bill is supported by the Bay Area Council, the lobby shop for the region’s largest employers; the California Building Industry Association; the Terner Center at UC Berkeley; the San Francisco Housing Action Coalition; and YIMBY groups, including East Bay Forward, Abundant Housing LA, and of course CaRLA. 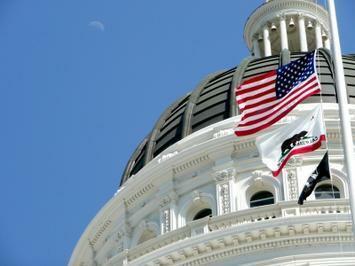 Opponents include the California Association of Counties and the American Planning Association. If these bills—especially SB 35—become law, Californians will have lost a good deal of their right to a say the life and governance of the communities in which they live. This piece was first published in Berkeley Daily Planet and Marin Post. Zelda Bronstein, a journalist and a former chair of the Berkeley Planning Commission, writes about politics and culture in the Bay Area and beyond.